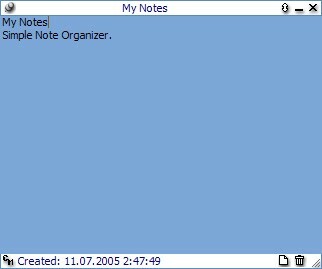 Simple Notes Organizer 1.3 free download. Simple Notes Organizer allows you to attach post-it like notes to your Windows desktop. Simple Notes Organizer allows you to attach post-it like notes to your Windows desktop. You can use individual settings for each note (color, font, opaque). Free Sticky Notes (desktop sticky notes freeware) is a new way to record, keep and manage important information, dates and events using desktop sticky notes. ATnotes is a software program which creates Post-it like notes on the Windows desktop. hott notes is the free sticky notes reminder solution for your desktop. S-Note is a simple and functional software that will let you create small reminder notes that can be saved and placed on your desktop. With a very user-friendly interface, Two Notes is a handy and easy to use desktop sticky notes application for office or at home. Need to add a note to your desktop, but don't want it getting lost beneath a group of windows? Then use Note-It. Free Notes is a easy to use reminder for Windows. Sticker Lite is a freeware Stickies organizer for Windows computers. FireNotes it's a simple desktop program used to take notes and store them in text files.